STEFANIE KOWALLICK Why is blockchain becoming increasingly important in the IoT? TIMO GESSMANN Established in 2009, blockchain has become a highly disruptive technology. In the beginning, it was mainly used for FinTech applications such as cryptocurrencies. Nowadays, however, blockchain is no longer just about digital currencies such as Bitcoin or IOTA. Blockchain will fundamentally change how we exchange value. In the age of the IoT, we have many devices that exchange information with each other. The challenge is to create trust in those devices. It can be compared to dealing with money: it is accepted to do business and to set up contracts. A person gives you money and you give some sort of value back to that person in return. In a digital world with IoT devices, there is a requirement for technology that enables humans to trust a device. In addition, this technology needs to ensure that the information the device provides is correct and trustworthy. Because blockchain fulfills these requirements, it allows digital contracts to be established between things – which is why it is becoming increasingly popular for IoT use cases. One IoT use case we have identified at the Bosch IoT Lab is using blockchain to prevent odometer fraud. 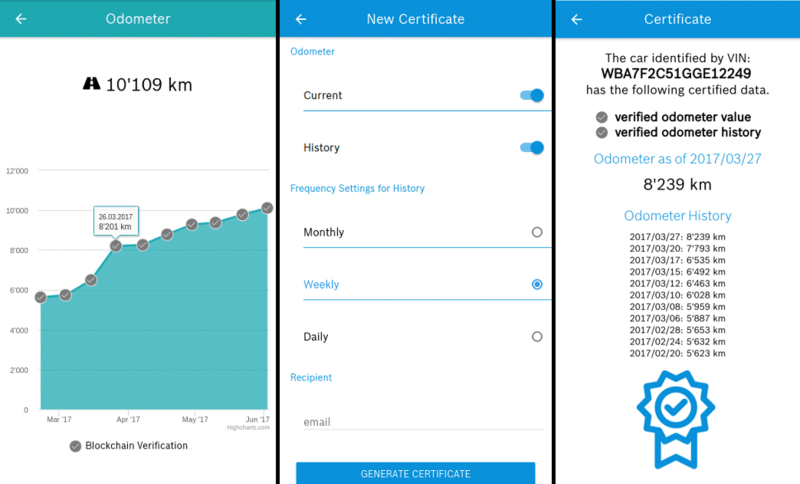 An app allows to check and verify odometer data. The Bosch IoT Lab is working on IoT-enabled new business fields with a focus on mobility, smart living and working, IoT business models, and blockchain technology. Timo Gessmann is the director of the Bosch IoT Lab. How did you come up with the idea to prevent odometer fraud using blockchain? Our research into existing problems in today’s markets revealed that odometer fraud is a widespread problem in the automotive market. There are many vehicles on the roads where the mileage has been manipulated in the past – without most of the current drivers being aware. Manipulating the odometer can increase the value of the car significantly. If I had driven 100.000 kilometers in my car, it would be worth less than if it had just 10.000 kilometers on the odometer. That is why there is a high motivation to manipulate car data – especially nowadays that mileage data is just digital information stored in the car. At the Bosch IoT Lab, we are keen to explore whether blockchain technology can help build trust in car data – especially the mileage data. How can blockchain help to create this kind of digital trust? Blockchain is a decentralized database that stores a registry of assets and transactions across a peer-to-peer network. The transactions get locked in blocks that are cryptographically linked and secured. These blocks are stored on every computer in the network. For this reason, the transaction information cannot be hacked without the attacker having to hack into the majority of the other computers in the network that store exactly the same information, too. This being the case, blockchain can help reduce uncertainty when exchanging value without the need for intermediaries such as banks, governments, and corporations. "Odometer fraud is a widespread problem in the automotive market. Can blockchain provide a remedy?" We want to develop a certificate based on blockchain that ensures a car’s mileage data is correct. Last year, we started with a proof of concept and connected a real car to the blockchain. We installed a connectivity device in the car to read its mileage data. Using the connectivity device we then transmitted the data to a backend which is connected to a blockchain. The Bosch IoT Lab explores, whether blockchain can help prevent odometer fraud. In addition, we developed an app for consumers that enables them to view the mileage history of their car. What’s more, users can access an online service to get a digital certificate indicating whether the mileage has been manipulated or not. Our minimal viable product is a complete IoT solution including a connectivity device that is connected to the car, an app for consumers, and a live service to certify the mileage data. By using this live service, consumers can easily create a digital certificate for their cars and also share the information with other entities in order to create trust in the specific car data. Furthermore, we are collaborating with an original equipment manufacturer and have a fleet with about 100 cars in Germany and Switzerland that is connected to the blockchain. This is a field test and we are still working on the project, as the technology is not yet ready for the mass market. Given that blockchain is a fairly new technology are you facing any challenges? With blockchain technology being quite new – especially in the IoT – we are encountering some challenges. One, for example, is that the blockchain technology must be highly scalable. It must support millions of cars around the world that are connected to the blockchain database. At the moment, this is not really possible because the technology is quite slow. Another challenge is the cost of using the existing blockchain technology. It is open source, which means it can be used and explored for free. But for each transaction a fee must be paid to use the public blockchain – each and every time data is transmitted to the blockchain database. These costs are hard to predict. If millions of cars were to be connected to the blockchain, huge costs would be incurred each time data was transmitted to the mileage database. We are currently trying to figure out how to reduce such costs for this use case. The Bosch Internet of Things and Services Lab has been formally opened in September 2012. It is a cooperation between the University of St. Gallen and the Bosch Group. Both organizations agree that the cooperation between academia and industry is an ideal setting to explore the opportunities the Internet of Things will provide. What are the next milestones in your project to get the blockchain-based certificate market ready? The technology as such is working – which is great. The next step is to evaluate the business model. To do this, we will involve our partners such as OEMs, TÜV Rheinland and other IoT and Blockchain companies. In addition, we will continue to expand our ecosystem with partners, consumers, and customers. We want to ensure that we get a broad range of market feedback about the benefits and challenges of using blockchain for this use case. Stay tuned! 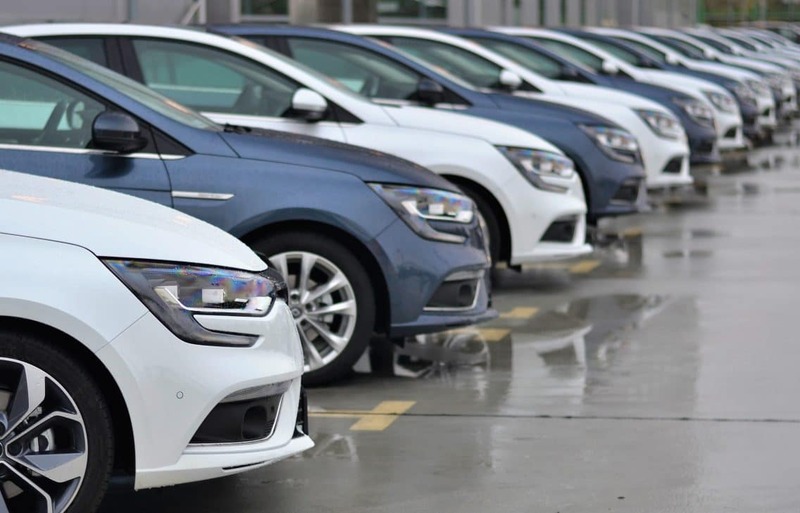 The post How blockchain can help to prevent odometer fraud appeared first on Bosch ConnectedWorld Blog.